This learner guide provides information for a learner to develop the knowledge and skills to select, correct and interpret a technical drawing. 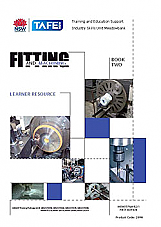 This learner guide is to allow learners to develop fundamental machining skills. This learner guide provides the learner the knowledge and skills to select the correct brazing consumables and deposit capillary joints on ferrous and non-ferrous metals in accordance with nominal production weld quality. This learner guide provides the learner the opportunity to identify the importance of and develop basic skills in materials handling in an engineering organisation. 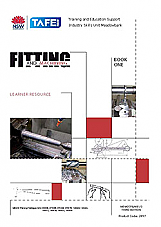 This learning guide provides the learner with the knowledge and skills required for the fabrication of detailed plastics products to specifications. 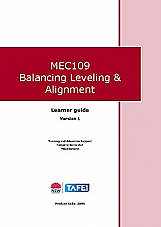 Balance (static and dynamic) a pulley, rotor or shaft (rigid only), level and/or align shafts, couplings, pulleys foundations and machine tools. This learner guide is theory book 1 Fitting & Machinery. This learner guide is theory book 2 Fitting & Machinery. 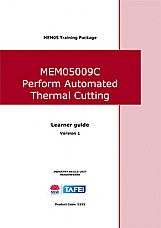 This learner guide has been designed to develop knowledge and skills to competently cut and gouge ferrous and nonferrous materials using fuel gas, carbon arc and plasma cutting and gouging equipment from a range of materials and structures used in fabrication industries. This learner guide will provide you with the knowledge and skills to select equipment, set-up and apply automated cutting processes for the manufacture of engineering components. It contains technical notes, procedure sheets and a range of practical exercises to underpin typical workplace practices.